It seems like a long time since I was able to get in a week of exercise that I consider very good. It seems to have been a long lull, with the cycling accident on April 8th (week 15 on the chart below). Then the travel to Washington State, Utah, Atlanta and Florida. Although I was trying to get in some exercise while traveling and while recovering, it was not at the level I usually can do and much of it was on a bike trainer. After returning from Atlanta (week 20), we started our crash recovery course on cycling, quickly getting ready to a Century ride that Saturday. It was the first time for quite awhile for both Anne and I to reach 200 miles of cycling in a week. The next week should have been much better than it was, but the long ride we were planning on that Saturday turned out to be short due to very cold condition. But for this week (week 22), I biked nearly 400 miles. Yesterday was my first time to cycle without any splint on, and it worked okay. I went on the long distance training ride with the club (Anne could not join due to a conflict). The 115 miles seemed not too difficult, but I did have a hard time to keep up with the guys I usually can hang right with. My climbing is slowing coming back but I still have a ways to recover. If I look at the accumulated cycling miles over this year, compared with prior years, the fall off is quite apparent. From being ahead of any prior years, I have fallen back, well below last year. Due to issues with my knees, my running has been very moderate for several months now. While traveling, I did run more than I had been, but it is still at a relatively low level, never getting more than about 16 miles in a week. My weight had climbed as my cycling at declined, but it is now finally coming back down, which is good news. On Friday I went to the doctor and he said my broken left thumb had healed well. He wants me to continue to use the splint for another two weeks but I was lucky to get a new splint. This one is made of neoprene and is much more flexible. 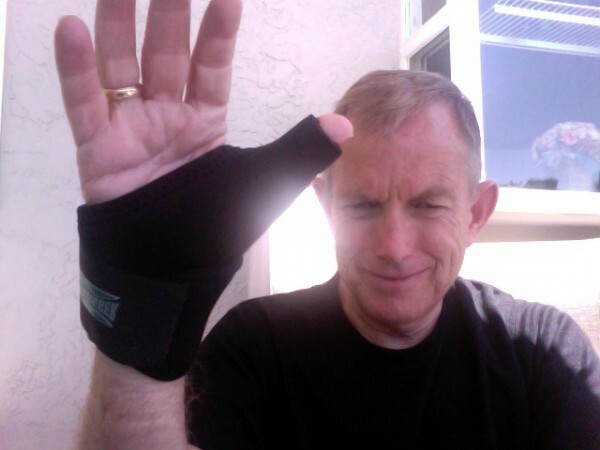 I tried it out on a bike ride on Saturday and it was much easier to bike with than the old hard splint I have been using. It was six weeks today that I fell near the end of a bike ride. It was not the first time I had a cycling accident but it has been several years since the last time and the first time I ended up with an injury that has taken this long to recover from. Last week, after 5 weeks of wearing a splint, I finally made my way back on my road bike. Then last Saturday, Anne and I, completed a flat century ride. This week I finally made it back on to the tandem, which we rode yesterday and today. So in celebration of getting to the 6 week mark when bones are suppose to be healed enough, I decided to go on the night ride up Henry Coe, the very same ride when I had the crash 6 weeks ago. Over the past week I have learned to ride well enough with my left thumb held out by the splint. I just can not shift the front derailleur without reaching over using my right hand. Braking with the left hand is also an issue, so I have been doing mostly flat riding and just braking with my right hand. But enough waiting already and I felt okay to do a ride with a significant climb. About 6 of us showed up for the ride. With this group I can usually push the pace enough to drop most all of them. But today I could not. Taking my heart rate up much higher than I usually do during a climb kept me in front of most of the riders, but not a couple of them who went out ahead. During the lower section of the climb I was above 170 bpm, going as high as 176. In this type of group ride I usually never go above 165. But this higher heart rate is usual when I have been off the bike for awhile and have not been pushing the pace and climbing. It seems that at my age, my cardio system declines faster than my legs. When I am in shape and climbing the legs become the limiting factor, but tonight it was the heart and lungs. But just as the cardio system declines faster, it also recovers faster so I am confident that with some more work, I can regain my conditioning. Descending down Henry Coe was a bit problematic. I can easily brake with my right hand (rear brake) but bicycles are meant to be used with two brakes. So I had to keep the pace at a much slower decent and even then I did use my left hand somewhat to brake, but I could not wrap my left thumb around the bar when in the drops. It has kind of made me off balance and I found that I was pushing the inside of my right leg against the top tube, I suppose to get more rigidity with the left fingers pulling on the brake without the left hand with a firm grip on the bar. With the slower pace, I felt fully confident during the decent. We have four weeks before out 10 day bicycle tour across the state of California. I am now confident we will be ready. Completing the ride up Henry Coe was exactly what I needed to get my confidence back again. And yes, the spot where I went down last time, I made that turn REAL SLOW.